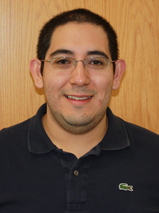 Luis de la Torre is currently a fourth-year PhD student in the department of Industrial Engineering and Management Sciences (IEMS). He received bachelor’s degrees in economics and mathematics from the University of California at Davis, and a master’s degree in IEMS from Northwestern University. His research focuses on developing stochastic and dynamic optimization models for transportation and distribution of critical supplies for disaster relief, as part of the humanitarian logistics team at Northwestern and as a graduate student intern in the CNLS Summer Student Program at Los Alamos National Lab. His co-advisors are Karen Smilowitz and Irina Dolinskaya. Luis is the principal instructor for IEMS 326, Economics and Finance for Engineers. He is also a member of the IEMS Graduate Liaison Committee, and is helping to prepare a new mini-course for incoming PhD students to teach and review fundamentals in mathematical analysis, statistics, and AMPL. In his spare time, he plays oboe in the Northwestern University Philharmonica. Luis was selected as the CCITT Student of Year for his research and academic excellence as well as his self-motivation, contributions to the engineering educational community, mentorship of undergraduate students, and key role in the development of humanitarian logistics initiatives at Northwestern University.